They call it runner’s high, but you can be a rock climber, snow boarder, surfer, skier, hiker or fitness enthusiast of any kind to experience a giddy feeling after exercising. If only exposure to the outdoors left your skin feeling as radiant as your mood. That’s what Tyler Ward was thinking when he created Giddy—an idea that started in his college dorm in 2009. 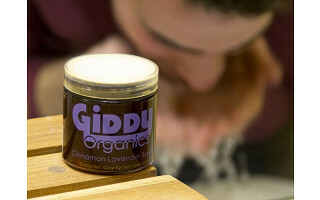 Giddy skin care products are all-natural, organic, and handmade. The Cinnamon and Lavender Face and Body Scrub exfoliates as it cleans leaving skin feeling smooth and revitalized. The Giddy Cedar Mint Balm is a hand lotion and healing salve containing essential oils and other natural ingredients especially formulated to help moisturize dry, rough skin. Non-greasy and fast-absorbing, this balm had our testers coming back for more. Tyler and the folks at Giddy believe skin care products should be as good for your skin as they are for the environment. Giddy sources ingredients that are Fair Trade certified and even their packaging is eco-friendly. Now, after a day outdoors, your skin can feel as Giddy as the rest of you. I'm Tyler, Founder of Giddy. 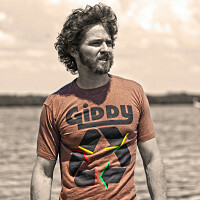 Giddy Organics is an outdoor lifestyle brand with a strong focus on sustainability and adventure. At Giddy, we believe that our love for the great outdoors should be embodied in every product we create. For that reason, we go out of our way to ensure our eco-friendly products are just that: friendly to the planet we enjoy exploring! Please feel free to ask me any questions! I'll answer them to the best of my abilities (just to note: I still don't know the meaning of life :D). Thanks! Hi! What do guys think about the lavender? Or does it smell more cinnamon? I'm thinking of this for a friend, but he's the type that would balk at anything "floral" smelling. @Jessica it has a pretty unique scent given that it has strong Cinnamon overtones. You can absolutely smell the lavender but when it is blended with cinnamon it masks the flowery aspect of lavender. Lavender is a sure undertone in regards to the scent. Do you have any plans for future scent combinations, and if so, which would you be leaning most heavily toward? @Isis yes! We were in the lab until 11 PM last night getting some scents together. We are releasing a ton of new products in the next month or so to increase our SKUs for our large retailers. Once we release our bar soaps some time later this year - we should have a wide wide variety of scents. @Isis hey so there is mint in the scrubs - Cinnamon Peppermint. One thing we wanted to do with Giddy was ensure all of our ingredients were functional rather than placeholders (emulsifiers/thickening agents) or that we released useless products that smelled amazing. The odd thing is - when you make a perfect product in terms of functionality - the scent pairing naturally goes with it. The reason we didn't come out with Cinnamon Peppermint originally is that Peppermint and Spearmint can cause clogged pores in people who are highly highly sensitive while Lavender does not. For our first scrub - we wanted to ensure it was universally appealing for all skin types and while peppermint may have a slight edge on scent - lavender has a slight edge on function. Now that we are starting to get some headway for how awesome our products work as opposed to just smell - I think we can start to get away with releasing some of the products with a great scent and simply note that people with extremely sensitive skin should stick to Cinnamon Lavender and Cinnamon Tea Tree for facial products. I have worked with Vanilla in small quantities. At some point - I'll add it to the lineup as it may be my favorite scent. However, it's just not something we play around with a lot and I won't release anything until it's been pretty thoroughly tested. @Tyler *or that we DIDN'T release useless products that smelled amazing. ^^Sorry it's hard to spellcheck with this scroll function. I'm on a PC and used to using a Mac. What benefits are there to the Face/Body scrub when compared to similar products and what exactly does it do for your skin? @Dan good question(s). First and foremost, I am not sure of any similar products on the market as far as natural alkalizing scrubs (other than Cetaphil which isn't natural) or even cinnamon scrubs go. In comparison to other facial scrubs - our product is an alkalizing facial scrub. In English: when developing this product we tried to make sure that the pH of the ingredients as a whole were close to the ingredients of your actual skin. So you aren't rubbing an overly acidic or base substance to your skin. Furthermore, the vinegar in the base of the product (which is cut by a base to reduce the pH) acts as an anti-inflammatory agent which is why we call this scrub your skin reset button. If you have been abusive to your skin for a few days by partying, trekking, climbing, or laying out at the beach, our scrub should bring your skin's pH levels back to a normal level and reduce inflammation - hence - you are "resetting" your skin back to normal. @Tyler Have you considered using Vetivier as the base to cut your vinegar? It has such a lovely aroma and certainly could be marketed more towards the masculine (though I love wearing it as a woman so it is all in the individual olfactory senses). . .
@Isis You cannot smell any vinegar in the final product, however, I'll buy some certified organic vetiver from our supplier next time we do R&D. It looks interesting! Thanks for the heads up. They call it runner’s high, but you can be a rock climber, snow boarder, surfer, skier, hiker or fitness enthusiast of any kind to experience a giddy feeling after exercising. If only exposure to the outdoors left your skin feeling as radiant as your mood. That’s what Tyler Ward was thinking when he created Giddy—an idea that started in his college dorm in 2009. 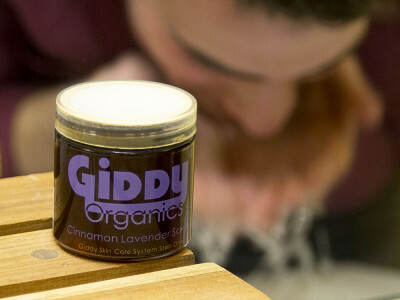 Giddy skin care products are all-natural, organic, and handmade. The Cinnamon and Lavender Face and Body Scrub exfoliates as it cleans leaving skin feeling smooth and revitalized. The Giddy Cedar Mint Balm is a hand lotion and healing salve containing essential oils and other natural ingredients especially formulated to help moisturize dry, rough skin. Non-greasy and fast-absorbing, this balm had our testers coming back for more. Tyler and the folks at Giddy believe skin care products should be as good for your skin as they are for the environment. Giddy sources ingredients that are Fair Trade certified and even their packaging is eco-friendly.